Our passion for building the best-performing, most enduring and alluring boats has reached new heights with the 55SX: New heights of luxury in a restyled, dual-stateroom layout with large master and equally spacious VIP cabin. New heights of style, from her powered sunroof down to a granite-topped galley. Of comfort, with more seating, a large bar and entertainment center, and a separate raised dinette. And power, with engine options up to twin 1,015 hp diesels and top speeds over 30 knots. Built on the acclaimed Eastbay Series hull designed by C.R. Hunt Associates, the 55 Eastbay is available as an enclosed-salon ’SX’ model and now as as a flybridge-topped ’FB’ model. Continue reading for more information on the Grand Banks 55 Eastbay SX. 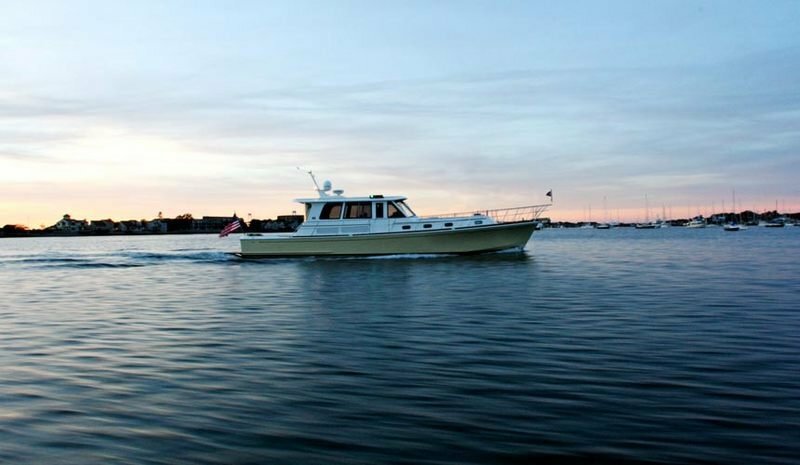 The ’SX’ version of our 55 Eastbay exemplifies the classic lines and sophisticated profile of a Downeast cruiser. Her large salon offers wide-open views, lots of light and great visibility through abundant windows. An optional sunroof lets you bring in even more of the great outdoors. 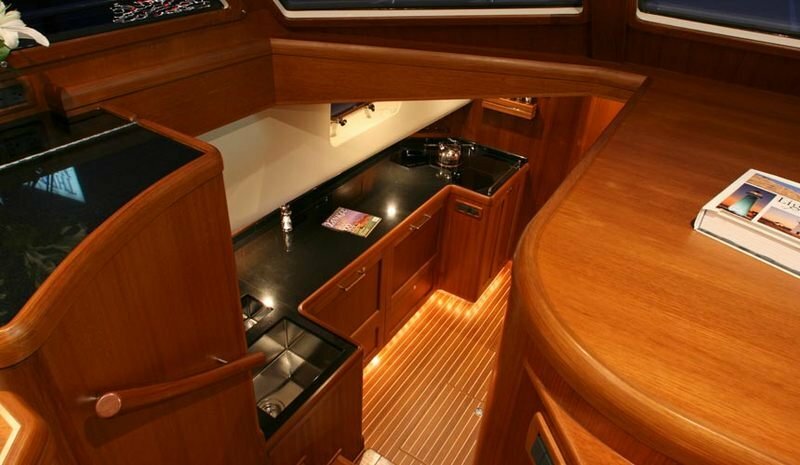 The standard layout of the 55SX features a port-side down-galley arrangement, accessed by a companion way just to port of the centerline. The long, large galley features granite countertops, a large sink, drawer-style refrigeration units, a built-in microwave-convection oven, and plenty of storage. A large freezer sits in a closet forward along the companionway, and extra storage for longer trips is easily accessed through the sole. When we built the 55SX, one of our priorities was to create a large, luxurious owner’s stateroom. With hand-crafted teak cabinetry throughout, the master cabin is a warm and inviting place to retire, with plenty of easily-accessible storage — including a cedar-lined hanging locker. An en-suite head with stand-up shower is equally well appointed. Let the sea breeze in: press a switch and the main aft salon window disappears into the bulkhead, activated by a hydraulic lift system. 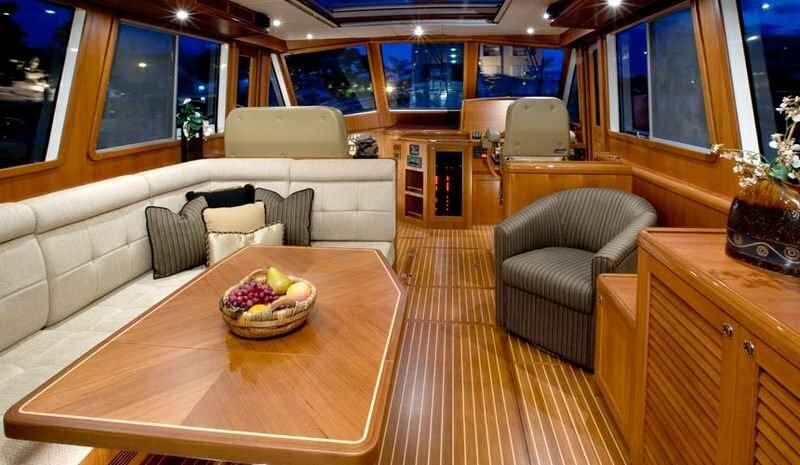 It’s a wonderful way to create a wide-open feeling on the helm deck, and allows easy passing of meals out to the cockpit aboard the galley-up model. 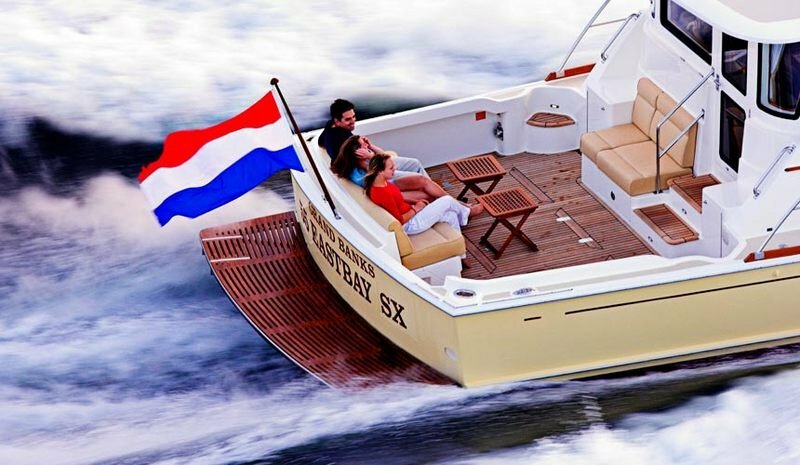 A main highlight of the 55SX is the enormous cockpit - almost two feet longer than that of her predecessor, the 54 Eastbay SX. Choose optional built-in seating along the transom, or take the standard arrangement without seating and furnish it yourself. Three large gas-assist hatches offer convenient access to an expansive lazarette. With barely the pull of your finger, the engine room hatch lifts on gas-assisted shocks to offer easy entrance. Inside you’ll find an efficient, well-designed engine room: electric, plumbing, HVAC and all other systems are sensibly laid out and expertly installed, with clear labeling that corresponds to the owner’s manual. 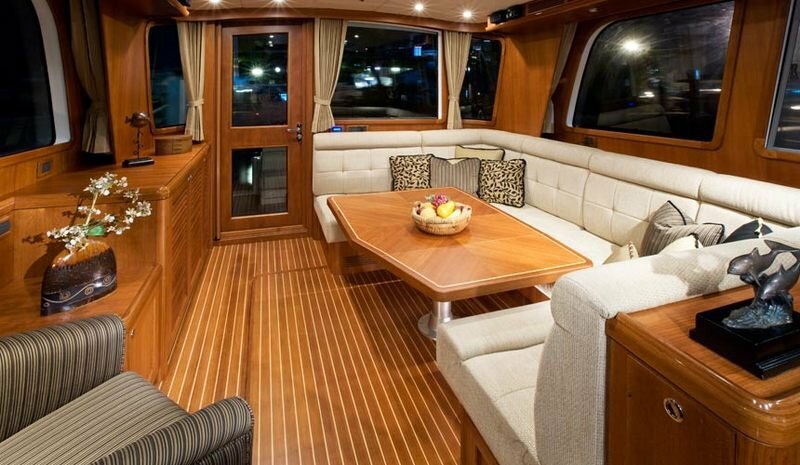 The standard layout of the 55SX includes a large U-settee aft, opposite an entertainment center (with pop-up flat-screen TV) and wet bar to starboard. The handmade, inlaid teak table is as functional as it is elegant: its automated system can lower the table to allow the settee to convert to a berth when extra guests are on board. 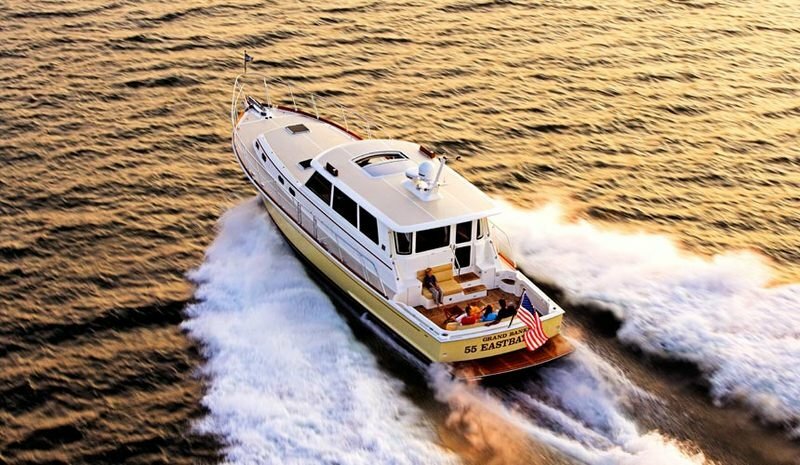 Owners of the 55 Eastbay SX have the option to install twin Caterpillar C-18 1,015 horsepower diesel engines, with an approximate top speed of 33 knots and a cruising speed of 26 knots. Standard engines are the "de-rated" C-18 engines, at 885 horsepower each, which offer a top speed of approximately 30 knots and a 25 knot cruising speed. The optional sunroof of the 55SX opens at the touch of a button, bringing even more light and air into the salon and creating a wonderful open environment. 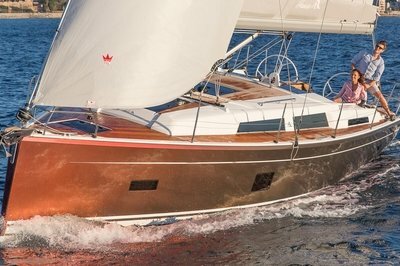 Top-quality equipment custom fitted for the 55SX deckhouse ensures a watertight fit when running with the sunroof closed. 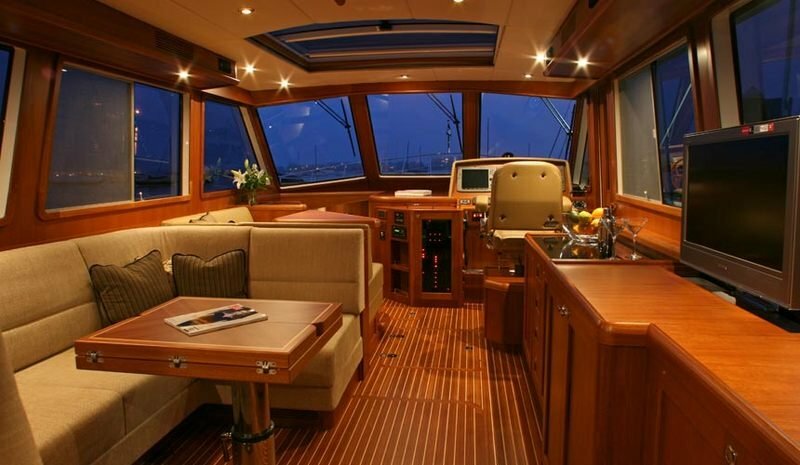 A large, easily-opened sunshade is included to protect the teak interiors and keep out the sun when necessary. Standard white and the popular Flag Blue hull colors have now been supplemented with a variety of new choices (pictured: "Flag Blue"). See your dealer for more information.